Gary Ablett: The Game of My Life - LFChistory - Stats galore for Liverpool FC! In essence this is a happy story because Gary Ablett was able to play football at a high level for many years. But it is not a story with a happy ending because, as everyone knows, Gary sadly did not survive long enough to see his words published. It is immediately clear, however, that the bulk of this book had already been written before the final stages of cancer took over to claim the life of a man who was still only in his mid-forties. All ghostwriter Paul Joyce and Jacqueline Ablett had to do was tie up a few loose ends and prepare the manuscript for publication, a task that must have been incredibly difficult for Gary’s widow as she tried to come to terms with her loss. Her bravery and that of her children come through as much as her husband’s in this book, especially in the moving chapter she added to the end called simply “A Light Shines On”. Plus there are emotional tributes from friends, colleagues and family members that make it very clear what a big role Gary Ablett played in their lives and how much they respected him and how highly they valued the contribution he had made to their own lives. This is a book that would have been published anyway, irrespective of the way things turned out. The way I read it “The Game Of My Life” isn’t about any particular match that Ablett played in, although there is an obvious clue in that title to the winning F.A. cup finals he appeared in for the two Merseyside clubs in 1989 and 1995. Many professional footballers can look back at one particular match that changed their lives. But perhaps the reality is that the game of Gary Ablett’s life wasn’t a football match at all but the way he fought for his own life with dignity and courage in the face of an aggressive and indiscriminate disease that would eventually claim him as another victim. After warm forewords from Kenny Dalglish and David Moyes, two early chapters go into detail about Gary’s shock at his condition being diagnosed and the treatment that followed. Some of the treatment descriptions are quite graphic and make for uncomfortable reading. Including them is just one part of the whole story though so I can understand why they weren’t left out. “There is nothing that can prepare you for the fight against cancer”, says Gary who, when told that the illness might spread to his brain realised that “never mind going back to work, was I actually going to survive this illness?”. With some of the early medical stuff dealt with, it is almost a relief to move on to football matters and these are dealt with in a dozen or so chapters, told neatly and accurately in chronological order. It probably wasn’t widely known before publication of this book that Gary Ablett was invited for a trial at Manchester United but was not impressed when asked to play in goal! Eventually he was training with Liverpool at Melwood on Tuesdays and Thursdays and progressing well there until the day came when the coaches felt that he was ready to take the step up into the first team. It was a daunting prospect for a young man who was, by his own admission, rather shy and insecure. “Liverpool’s was a powerful dressing-room. Everywhere you looked there were superstars”. Despite playing nearly a hundred and fifty times for Liverpool’s first team over five years, Gary’s biggest regret is that “I will always feel that I could have done better”. Despite signing a new four-year deal with Liverpool in November 1991, he did not expect to see it through and only two months later he was crossing Stanley Park to sign for Everton. Admitting that he had problems coping with the new Graeme Souness regime at Anfield because “Graeme’s style of management was clearly confrontational”, he quickly settled down at Goodison Park because “there wasn’t the same pressure; the spotlight wasn’t as intense on the club and that suited me down to the ground”. With his Merseyside football days behind him on joining Birmingham City in 1996, Gary was able to look back : “I have the memories of those two great days to fall back on. They are as fresh as ever”. But Gary Ablett doesn’t come across as a man who looks back for long. At the age of thirty-four he moved to the United States to play for a team in New York and was in the city at the time of the terrorist attack on the twin towers of the World Trade Centre, after which he became aware that friends and relatives were no longer keen on flying across the Atlantic to stay with him and his family. Feeling somewhat isolated by that lack of formerly regular contact, the Abletts moved back to England where Gary commenced the next stage of his life in football as the coach of Everton’s Under-17 side. Before long he was crossing Stanley Park again and working for his first club once more and under his guidance Liverpool’s Reserves became first regional then national champions in 2008. But he was uncomfortable about the “clash of cultures” at Anfield and definitely unhappy at being told by Rafa Benitez to pick new foreign players ahead of existing players. It was inevitable that a parting of the ways was not far away and in the summer of 2009 Gary Ablett was unveiled as the manager of Stockport County but under most difficult circumstances he was unable to prevent the club from slipping out of the Football League a year later. This setback did not cause him to question his own ability and he was happy to accept an offer to join Ipswich Town’s coaching set-up under Roy Keane. It was shortly after arriving in East Anglia that his health started to decline quite rapidly, with the subsequent serious diagnosis of his condition. In praising many from within and outside football for their support, help and encouragement, Ablett recognises that Keane’s support was “phenomenal”. Chapters called “Full Circle” and “Fear And Hope” bring a return to medical matters. As at the start of the book, these are difficult pages to read. Gary’s strength shines through every page : “I have tried to be as positive as I can throughout everything that has happened. I have tried to look forwards, not backwards, and concentrate on what I can do as a patient”. Gary’s brave fight as a patient finally came to an end but his legacy will live on through the foundation that will be set up in his name to keep his memory alive. Gary Ablett wasn’t a superstar nor did he ever claim to be one. He made more than a century of appearances for three different clubs in England plus a combined total of fifty plus for five more English Football League clubs and one in the United States. So in a way he was more of a journeyman than a master of his trade, always being prepared to look for and try a new challenge even though he had proved that he could be successful with his current challenge. This seems to be what encouraged writer Paul Joyce to take on this project : “Straight away it struck me that his story was different to that of other footballers”, says Paul, adding that Gary never complained during the long sessions as they discussed the book’s content together, sessions that must have taken a lot out of the book’s subject both physically and emotionally. 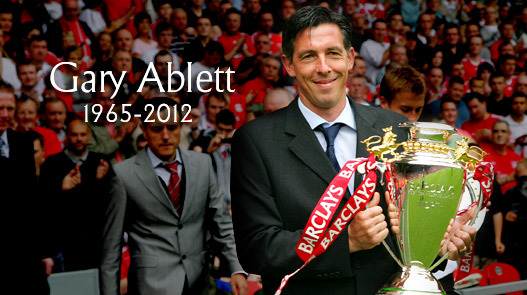 Ablett “wanted to educate the next generation of sportsmen about his illness and what he had learned through thirty years in the game”. Even when he must have known that time was running out for him, he still desperately wanted to get his message across to others. His tragically-early demise “robbed him of the aspirations to which he had still clung” but (Paul Joyce again) “this is Gary’s story, a story he wanted to tell. I’m glad to have helped ensure that happened”. Mister Joyce can be doubly glad. Not only did he see this project through to its conclusion but he has also ensured that Gary’s name will live on in the hearts and minds of those who knew and loved him as well as those who only watched him.